With the global population growing rapidly, and wealth in developing countries rising, long-term demand for energy is increasing. At the same time, CO2 emissions must be significantly reduced to avoid serious climate change. Shell is helping to meet this challenge by doing what we can today. We are producing more cleaner-burning natural gas, helping to develop technologies to capture and store CO2, producing low-carbon biofuel and working to improve our own energy efficiency. We also support moves towards a strong, global policy framework to manage CO2 emissions. All energy sources will be needed to meet future demand. This includes nuclear power and renewables, such as wind and solar. But even with government support, it will take time for renewable energy technologies to become available on a large scale. In 2050, fossil fuels could still meet at least 65% of energy demand, according to Shell analysis. The agreement to move towards a legally binding, global agreement on reducing CO2 emissions at the UN climate change conference in Durban in 2011 was a step forward. But it will not take effect for some years to come, and the world needs action now from governments, industry and consumers. Our approach to helping to tackle global CO2 emissions focuses on four main areas: producing more natural gas, helping to develop carbon capture and storage, producing low-carbon biofuel and working to improve energy efficiency in our operations. We also have a comprehensive governance structure in place that oversees all our CO2-related activities, including the research and development of technologies that increase efficiency and help reduce CO2 emissions. One-third of CO2 emissions from the total energy system come from the generation of electricity. Replacing coal with cleaner-burning natural gas in a power plant can cut its CO2 emissions by around half. For many countries, increasing the use of natural gas for electricity generation is the fastest and most affordable way to meet the challenge of delivering more energy with lower CO2 emissions. We supply natural gas to more countries than any other energy company and in 2012 we expect to produce more gas than oil. We are helping to advance carbon capture and storage (CCS) technologies through support for a number of projects around the world. Adding CCS to major industrial plants would significantly cut global CO2 emissions. As global population grows, the number of cars on the road will continue to rise. All lower-carbon fuel options will be needed to meet demand, while limiting CO2 emissions. Blending petrol and diesel with sustainable biofuels helps reduce CO2 emissions from transport fuel. In 2011, we launched the Raízen joint venture to produce the lowest-carbon biofuel commercially available, ethanol from sugar cane in Brazil. We are also working to make biofuels more sustainable and develop advanced biofuels from non-food sources. We are working to improve the energy efficiency of our operations. 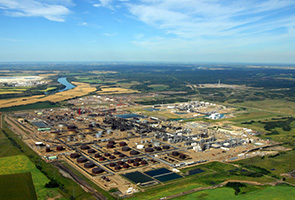 These include our oil and gas production projects, oil refineries and chemical plants. We also offer products and services to help our customers use less energy, including advanced fuels and lubricants. Government policies have an important role to play in how society responds to the threat of climate change. Governments and industry need to work together to develop these policies. We believe market-based mechanisms are the most effective approach and that governments need to create frameworks that put a price on CO2, such as cap-and-trade systems. This will encourage the use of all technologies to reduce CO2, starting with those that are the quickest and least costly to implement. In our own operations, we are working to understand the potential physical impacts of climate change in the future on facilities and new projects. As our business grows and production becomes more energy intensive, we expect the direct greenhouse gas (GHG) emissions from facilities we operate to rise in the coming years. But the lower-CO2 impact of the increasing amounts of natural gas and low-carbon biofuel we expect to deliver can contribute to the global effort to tackle climate change, as the life-cycle emissions of these fuels are lower than their alternatives. 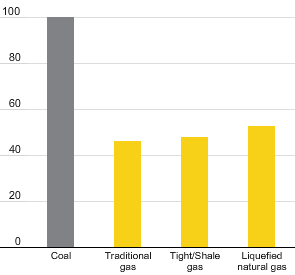 From production through to use in generating electricity, natural gas produces significantly lower CO2 emissions than coal. This applies across a range of production, processing and transport methods (see chart, above).